Our logo file in 200 x 200 resolution and PNG format. Contact us for our logo files in other formats. 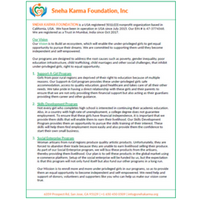 An overview about Sneha Karma Foundation and our programs in one page.